I’m not sure who originated the poster. They probably had good intentions. But turn to the Monticello website, the scholars who track Jefferson’s words most closely, in February 2012. 1. Noam Chomsky, Keeping the Rabble in Line: Interviews with David Barsamian (Monroe, Me. : Common Courage Press, 1994), 245. 2.Jefferson to William Branch Giles, December 26, 1825. Yes, I’ve quoted this letter myself above – I’m seeing that quote a lot lately. The full sentence as it appeared in Jefferson’s letter is, “I hope we shall take warning from the example and crush in it’s birth the aristocracy of our monied corporations which dare already to challenge our government to a trial of strength, and to bid defiance to the laws of their country.” The letter was first published in Ford’s Writings of Thomas Jefferson in 1892 (see http://hdl.handle.net/2027/uc2.ark:/13960/t3pv6bn68?urlappend=%3Bseq=93 – the edition you link to is a 1904 commemorative edition of Ford), and the polygraph copy is also online: http://hdl.loc.gov/loc.mss/mtj.mtjbib022651. In any case, it’s not the end of our democratic republic yet! Get out there and organize, and vote. Jefferson always offered good advice. Commenter SBH put me on to this interesting set of principles from a mathematician, on bogus quotes, and how to determine that they are bogus, and most important, how to avoid creating a bogus quote by stripping context or altering the text. I looked up Martin Porter. What are his principles of quotations? Who is he, and why should we listen to him? Mathematician Martin Porter, in the 21st century. Self portrait. 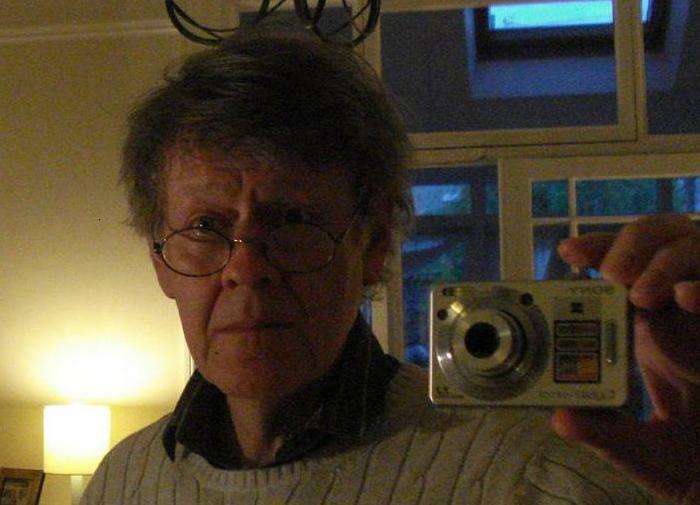 Turns out he’s a mathematician who works in algorithms to study language, and a founder of Grapeshot. Along the way, he grew intrigued with trying to source a very famous quotation attributed to Edmund Burke (confess, you don’t really know enough about Burke to describe who he was, or why that quote might not be his, right? See Porter’s last principle). Porter wrote an interesting essay about the experience, and about the wide abuse of the real Burke quote and what he’d learned. At the end of the essay, he posed principles for quotations, two involving how we might hold the necessary skepticism that helps smoke out quotes that are bogus for one reason or another. The other two, I confess, sometimes are difficult to follow. One of my favorite statements from George Santayana, in the upper right corner of this blog, stands out of context (he wasn’t writing about history, really), nor have I read the entire book. Porter proposes very high standards indeed: It’s not enough that the quote be accurately phrased and attributed appropriately to its creator; Porter wants the quote to be used in a similar context. In his essay on the Burke quote, he notes Burke was talking of factions, but when Ronald Reagan used it, even getting the phrasing right, Reagan used it to talk about arming nations. Porter suggests such a usage can lead us awry. Edmund Burke (1729-1797), Irish statesman, author, orator, political theorist and philosopher, who, after moving to England, served for many years in the House of Commons of Great Britain as a member of the Whig party. No, not the same Whig Party that produced Millard Fillmore in America. Porter is right, of course. 2014 is a federal election year. Here in Texas we also have municipal elections in May — a lot of opportunities, to vote, a lot of campaigning, and a in that campaigning a stunning wealth of opportunities for people to misattribute quotes, or to invent whole new inappropriate contexts, twists, and diversions to accurate understanding. We should heed Martin Porter better, perhaps. * You knew that one was bogus. Right? Item from The Associated Press‘s “Today in History” feature, for December 21: “1620 – Pilgrims aboard the Mayflower went ashore for the first time at present-day Plymouth, Mass.” Why in December? The arrived at the place almost a month earlier, but because of delays in getting out of England due to the leaky second boat (which didn’t make the trip), and difficulties encountered en route, when the group anchored, they first had to come to an agreement how to govern the colony, so far out of the territory of the charter they had been granted, as explained below. Originally, a version of this desultory ran here, on July 26, 2006. 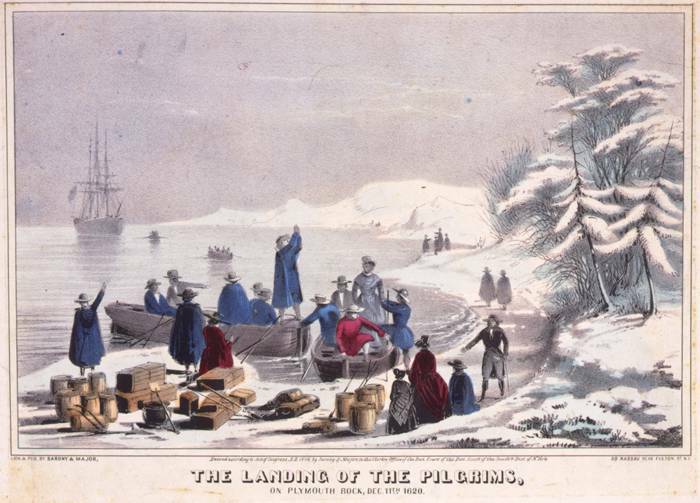 From the Library of Congress, one of the few illustrations of the event that makes it clear it was near winter: The Pilgrims landing on Plymouth Rock, December 1620 Credit: Sarony & Major. “The landing of the Pilgrims, on Plymouth Rock, Dec. 11th 1620.” c1846. Prints and Photographs Division, Library of Congress. Dispatches from the Culture Wars features a set of comments on an interview right-right-wing pundit John Lofton did with Roy Moore, the former chief justice of Alabama’s Supreme Court who lost his job when he illegally tried to force his religion on the court and on Alabama. In 2006 Moore ran for governor of Alabama, losing in the primary election. One of the grandest canards in current thought about U.S. history is that the Mayflower Compact set up a theocracy in Massachusetts. Lofton and Moore banter about it as if it were well-established fact — or as if, as I suspect, neither of them has looked at the thing in a long time, and that neither of them has ever diagrammed the operative sentence in the thing. The Mayflower Compact was an agreement between the people in two religiously disparate groups, that among them they would fairly establish a governing body to fairly make laws, and that they would abide by those laws. Quite the opposite of a theocracy, this was the first time Europeans set up in the New World a government by consent of the governed. That is something quite different from a theocracy. I think people get confused by the run-on sentences, and the flattering, intended-to-be-flowery language in the clauses prefacing the meat of the document. First, a very brief history: There were two groups aboard the ship in 1620, about 70 artisans and craftsman along to provide the real work to make sure the colony made money, and about 30 religious refugees. The London Company (accurately) thought the religious refugees lacking in key skills, like trapping, hunting and hide tanning, and barrel-making (barrels were needed to ship goods to England). So the London Company had insisted the craftsman go along, to make sure somebody knew how to harvest stuff and ship it back. The London Company had a charter to establish a colony in Virginia. Because of delays with leaky ships and uncooperative winds, the Mayflower got to America late, and much farther north. The Mayflower landed well outside the territory the company was chartered to colonize, and the 70 craftsmen announced they were striking out on their own. Bradford realized his group would freeze, or starve, or both, and at gunpoint he kept both groups aboard ship to work out a compromise. In the name of God, Amen. We, whose names are underwritten, the Loyal Subjects of our dread Sovereign Lord, King James, by the Grace of God, of England, France and Ireland, King, Defender of the Faith, e&. See what I mean? It’s loaded with clauses that tend to obscure what is going on. Starting out with the standard contract language of the day, “In the name of God, Amen,” it loses modern readers. We tend to think that with so many mentions of God without a “damn” following, it must be a religious document. But it’s not. We, whose names are underwritten . . . do by these presents, solemnly and mutually in the Presence of God and one of another, covenant and combine ourselves together into a civil Body Politick, for our better Ordering and Preservation, and Furtherance of the Ends aforesaid; And by Virtue hereof to enact, constitute, and frame, such just and equal Laws, Ordinances, Acts, Constitutions and Offices, from time to time, as shall be thought most meet and convenient for the General good of the Colony; unto which we promise all due submission and obedience. Got that? They promised to form a government, enact fair laws, and obey those laws — government by consent of the governed, by mutual compact, not by divine right. Just because God is mentioned in the document doesn’t change its nature. It’s a secular compact, an agreement between men, outside the stricture of any church, outside any particular belief. As we noted over at Ed Brayton’s site, Dispatches from the Culture Wars, many New England settlements and towns became little theocracies. But it wasn’t the Mayflower Compact which set that up, or encouraged it. 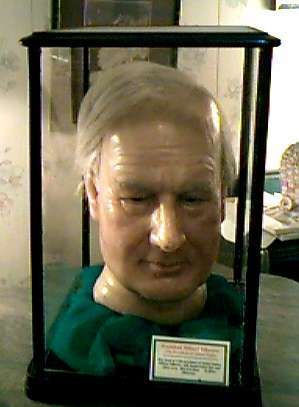 A wax likeness of Millard Fillmore’s head, appearing to be for sale for $950.00 back in 2007. Did anyone ever buy it? Yes, it does bear an unusual resemblance to Tom Peters. Buffalo, N.Y., March 8 — 12 o’clock, midnight. — Ex-President Millard Fillmore died at his residence in this city at 11:10 to-night. He was conscious up to the time. At 8 o’clock, in reply to a question by his physician, he said the nourishment was palatable; these were his last words. His death was painless. First, I wonder how the devil the writer could possibly know whether Fillmore’s death was painless? And second, accuracy obsessed as I am, I wonder whether this is the source of the often-attributed to Fillmore quote, “The nourishment is palatable.” Several sources that one might hope would be more careful attribute the quote to Fillmore as accurate — none with any citation that I can find. Thinkexist charges ahead full speed; Brainyquote removed the quote after I complained in 2007. Wikipedia lists it. Snopes.com says the quote is “alleged,” in a discussion thread. I’ll wager no one can offer a citation for the quote. I’ll wager Fillmore didn’t say it. What were Millard Fillmore’s last words? They may be buried in the notebook of one of his doctors. They may be recorded in some odd notebook held in the Buffalo and Erie County Historical Society, or in the Library of SUNY Buffalo, or in the New York State Library‘s dusty archives. Millard Fillmore: We’d protect his legacy, if only anyone could figure out what it is. This is partly an encore post, based on a post from 2007. 2012 is an election year, a time when we make history together as a nation. Potential turning points in history often get tarred with false interpretations of history to sway an election, or worse, a completely false recounting of history. Especially in campaigns, we need to beware false claims of history, lest we be like the ignorants George Santayana warned about, doomed to repeat errors of history they do not know or understand. How to tell that a purported piece of history is bogus? This is mostly a repeat of a post that first appeared at Millard Fillmore’s Bathtub six years ago. Please go read Park’s entire essay, it’s good. And it got me thinking about whether there are similar warning signs for bogus history? Are there clues that a biography of Howard Hughes is false that should pop out at any disinterested observer? Are there clues that the claimed quote from James Madison saying the U.S. government is founded on the Ten Commandments is pure buncombe? Should Oliver Stone have been able to to more readily separate fact from fantasy about the Kennedy assassination (assuming he wasn’t just going for the dramatic elements)? Can we generalize for such hoaxes, to inoculate ourselves and our history texts against error? Perhaps some of the detection methods Park suggests would work for history. He wrote his opinion piece after the Supreme Court’s decision in Daubert v. Merrell Dow Pharmaceuticals, Inc., in which the Court laid out some rules lower courts should use to smoke out and eliminate false science. As Park described it, “The case involved Bendectin, the only morning-sickness medication ever approved by the Food and Drug Administration. It had been used by millions of women, and more than 30 published studies had found no evidence that it caused birth defects. Yet eight so-called experts were willing to testify, in exchange for a fee from the Daubert family, that Bendectin might indeed cause birth defects.” The Court said lower courts must act as gatekeepers against science buncombe — a difficult task for some judges who, in their training as attorneys, often spent little time studying science. Some of the Daubert reasoning surfaced in another case recently, the opinion in Pennsylvania district federal court in which Federal District Judge John Jones struck down a school board’s order that intelligent design be introduced to high school biology students, Kitzmiller v. Dover Area School District. Can we generalize to history, too? I’m going to try, below the fold. Justice Stephen G. Breyer encouraged trial judges to appoint independent experts to help them. He noted that courts can turn to scientific organizations, like the National Academy of Sciences and the American Association for the Advancement of Science, to identify neutral experts who could preview questionable scientific testimony and advise a judge on whether a jury should be exposed to it. Judges are still concerned about meeting their responsibilities under the Daubert decision, and a group of them asked me how to recognize questionable scientific claims. What are the warning signs? The scientific effect involved is always at the very limit of detection. The author pitches the claim directly to the media or to organizations of non-historians, sometimes for pay. The author says that a powerful establishment is trying to suppress his or her work. Bogus history relies more on invective than investigation; anyone with an opposing view is an “idiot,” or evil. The sources that verify the new interpretation of history are obscure, or unavailable; if they involve a famous person, the sources are not those usually relied on by historians. Evidence for the history is anecdotal. The author says a belief is credible because it has endured for some time, or because many people believe it to be true. The author has worked in isolation, and fails to incorporate or explain other, mainstream versions of the history of the incident, and especially the author fails to explain why they are in error. The author must propose a new interpretation of history to explain an observation. Any history account that shows one or more of those warning signs should be viewed skeptically. In another post, I’ll flesh out the reasoning behind why they are warning signs. If Stalin said America is “a healthy body,” why can’t anyone find the source? Joseph Stalin would have to have been drunk to call the U.S. “healthy,” and to have complimented America’s patriotism, morality and spiritual life. Even then, it would be unlikely. Why does this quote keep circulating? I can’t find any source for it; it’s mostly quoted on right-wing sites where people marvel over what a prophet Stalin was. All requests for a citation in five or six different forums I’ve checked, are unanswered. Nothing like it appears at the often-checked Wikiquote. The Stalin Archive holds nothing close to the claimed quote. Perhaps more telling: Is it likely that Joe Stalin ever would have called the U.S. “a healthy body?” Stalin was of a school that claimed capitalism was diseased, and America was infested with a soon-to-be terminal case. If he called America “diseased” by patriotism and religion, it would be consistent with other statements, but his calling America healthy for patriotism and spiritual life, it’s inconsistent with other claims he made, about America and about capitalism (see Stalin’s 1929 remonstrance to the U.S. Communist Party, for example). So, Dear Readers, my request to you: Can you offer the source of this quote, Joseph Stalin or not? 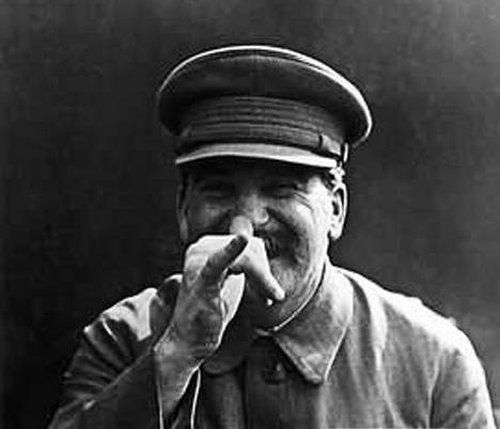 Why would a false claim from Stalin get such a life on the internet? Update, March 15, 2012: I’m calling this one: It’s a bogus quote. Joseph Stalin didn’t say it. Not as many comments here as e-mails and comments on other discussion boards and Facebook — no one has come even close to anything like the line above from Stalin. No source quoting the line even bothers to give a decade, let alone a year, a location, and a citation that would pass muster in a sophomore high school English class. Tea Partiers, you’ve tried to twist history again — stop it. Update March 1, 2013: If you’re checking in here studying for a DBQ for an AP class, please tell us in comments, which AP class, and what city you’re in. Thanks. Utah has a movement out to slander education and the Constitution, with a pointless claim that the Constitution cannot be called a “democracy,” damn Lincoln, Hamilton, Madison, Washington, both Roosevelts, and Reagan. Sadly, it started in my old school district, the one where I got the last nine years of public school education, Alpine District, in the north end of Utah County. Can you vouch for any of these “quotes?” Is any one of them accurate? The Jefferson “mob rule” quote isn’t in any Jefferson data base that I can find. I find it also attributed to George Washington — but almost always without any citation, so you can’t check. As for a moral people, Washington said there could be no morality without religion and called it the “indispensable support,” not education. Obviously Jefferson and the Founders wanted education of the constitution to take place but we are very far removed from it in our education system. The last one is probably accurate, but irrelevant to this discussion (nice red herring, there, Oak). Can you offer links to verify any of them? Is this what I suspect? The “Utah Republic” drive is not only a tempest in a teapot (though perhaps caused by other more serious maladies), but also a tempest based on false readings of history? The website for “Utah Republic” is maintained by a guy named Oak Norton, who is obviously in thrall to the voodoo histories of David Barton and Cleon Skousen (I think Barton stole a lot of his voodoo history from Skousen, but that’s another topic for another day). Funny: Nowhere do these guys discuss one of the greatest drivers of the republic, over more egalitarian and more democratic forms of government. Remember, Hamilton preferred to have an aristocracy, an elite-by-birth group, who would rule over the peasants. He didn’t trust the peasants, the people who he saw as largely uneducated, to make critical decisions like, who should be president. Norton doesn’t trust the peasants to get it right, and so he wants to dictate to them what they are supposed to know, in Nortonland. Just because Oak Norton slept through high school history and government is no reason to shut down Utah’s Alpine School District or any other school; he’s not offered much evidence that everyone else missed that day in class, nor evidence that it has any significant effect. 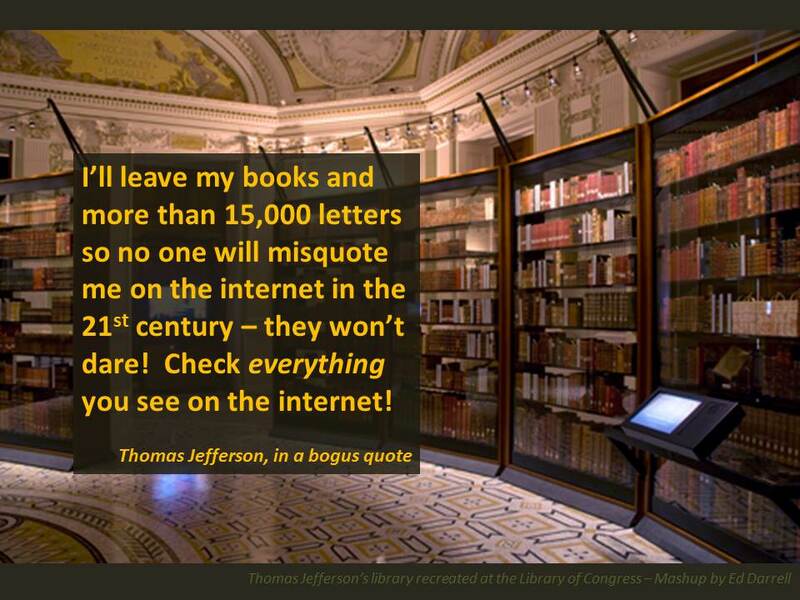 Jefferson’s advice on quotes found on the internet, backdropped by his books now held by the Library of Congress. You are currently browsing the archives for the Bad Quotes category.